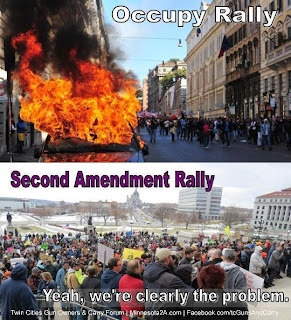 At each of the Tea Party rallies here in Richmond and at the state capital recently, I have spoken to police officers who were on duty at the rallies. A former Sgt. of the Richmond Mounted Squad is an old friend and a Major with the Capital Police is a retired FBI agent. I asked them about dealing with the crowds and they both said the same thing, "Floyd, we never have any problems with these folks." Having dealt with Earth Day rallies and Occupy rallies in Richmond, my friend told me how after their events, and the numerous arrests that go with them, there is always the clean up that is necessary. The trash they leave is incredible. With the Tea Party and the 2nd Amendment groups there is never any clean up or arrests. Now, of course, this is purely anecdotal on my part and no scientific research has been conducted, but from my observations the media is lying their a**** off when it comes to how they portray us (As if you didn't already know that).